Hi everyone and welcome to Red Couch Recipes! 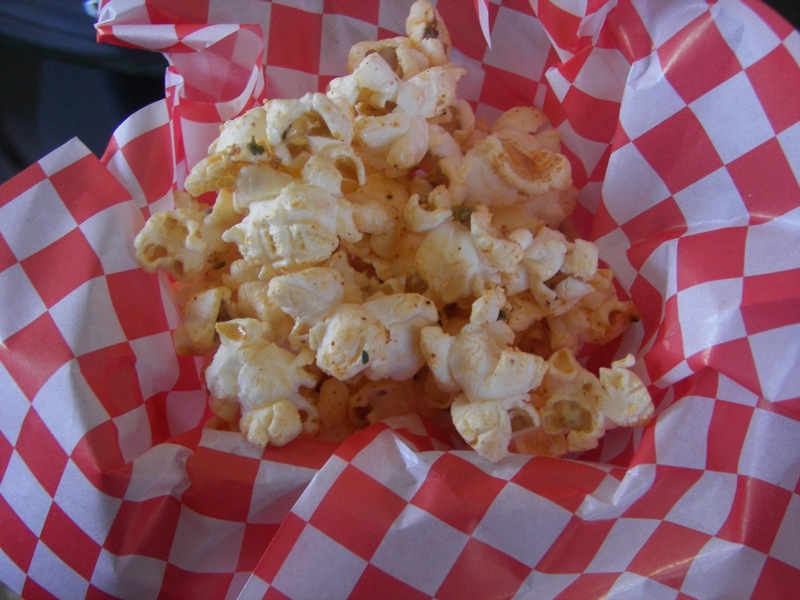 Almost everyone loves popcorn, whether sweet or savory. I love this Nacho popcorn. It is easy to make and most likely you will have all the ingredients that you need right in your pantry. This was featured in my Popcorn and a Movie Tablescape on Wednesday. In a simpler time, when I was a child, a real treat was popcorn and Kool-Aid on a weekend night. We would pop the corn in a stock pot on the stove with some oil. This recipe ramps up the popcorn treat idea just a bit by adding yummy Parmesan cheese and spices -- it would make a great weekend treat. 5 quarts air-popped popcorn --I used 6 quarts and I think it would still be good if you had as much as 8 quarts of popcorn. 6-10 drops of liquid hot sauce -- I used Frank's Hot Sauce. Pop popcorn in an air popper machine. Set aside. Melt butter in a medium sauce pan and add the Parmesan cheese, parsley, garlic powder, and hot sauce. Mix together and drizzle on popcorn. 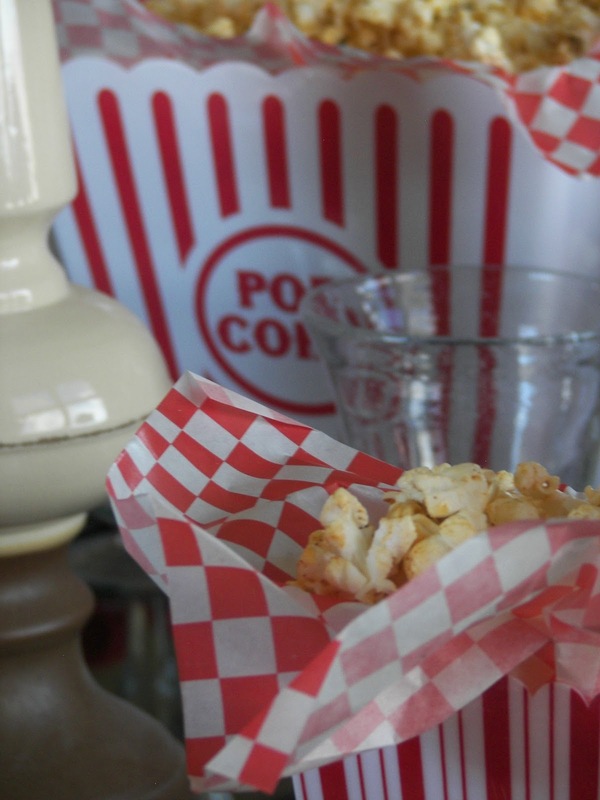 With two large serving spoons toss popcorn until the seasoned butter covers the popcorn well. Note: If you are using microwave popcorn, you could try to add less butter. We liked it best eaten right away, but I am always a fan of stale popcorn. 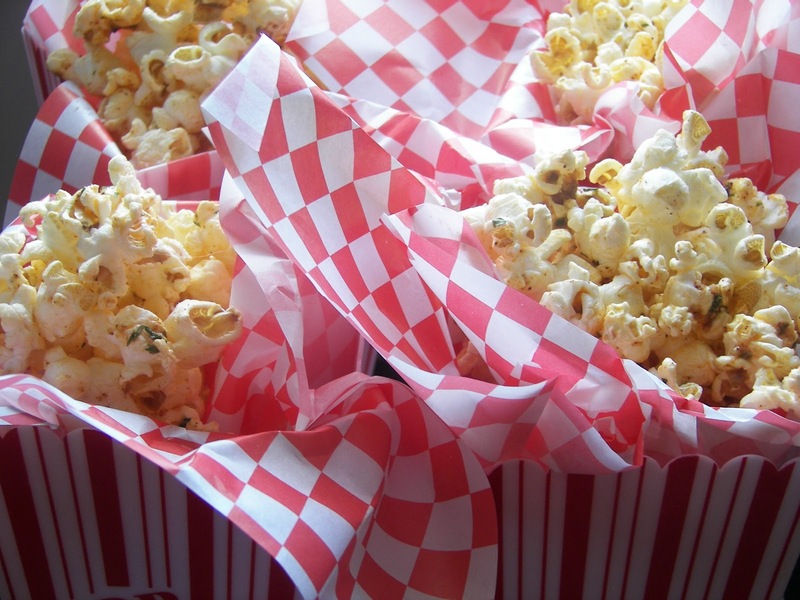 Make some Nacho Popcorn this weekend! Oh, anything with Frank's hot sauce. This sounds fantastic. I will have to try some. Chase sits and pours hot sauce on everything. We are addicted to the Buffalo sauce too. You are such a fun mom. Do your kids thank you enough? I know mine don't!!!!! This sounds really good! I will have to try it out on the next movie night! Thanks for the recipe. Your tablescape is so cute! I always know that I 'm going to be in Trouble when I open your posts. I know that this will suit our taste buds altogether too well! Sounds delicious! I may need to try it tonight! My kids would love this! What a neat movie treat. This sounds great. Mr. Sweet and I eat a lot of popcorn and this will be something new to try. We love popcorn at our house. Just putting butter on it would be a treat for us, I'd love all this extra flavor too!